Running burns more calories than any other mainstream exercise. But despite the fact that running has been proven to reduce your risk of chronic illnesses, such as heart disease, type 2 diabetes and stroke, there has been a lot of debate around whether our bodies truly can adapt to running long distances, such as marathons. It is known that the heart and lungs can become stronger and more efficient to help propel you forward – but what about your muscles and tendons? Can they adapt to make the very act of running more efficient, too? This 26.2-mile race got its name from the legend of Pheidippides, who ran slightly less than 26 miles from Marathon to Athens to announce the Athenian army’s victory over the Persians. Once poor Pheidippides arrived and proclaimed: “Rejoice, we conquer”, he is said to have fallen over dead. Could this simply have been the sorry result of his lack of long-distance training? The medical community is still largely in the dark on how our bodies react to long-distance running, but new research shows that, for regular runners, the beneficial adaptations are substantial. Through adaptations that happen gradually as you run further and more often the tendons of the legs can be used more efficiently in propelling you forward, meaning your muscles don’t need to work as hard. And that’s not all. The benefits of these changes in muscle-tendon behaviour become more important at higher speeds. Because we need more energy to propel us forward at higher speeds, the advantage of efficient tendons becomes even greater the faster you go. We conducted a study, published in the Journal of Applied Physiology, at Liverpool John Moores University on two groups of runners with very different levels of training: one group consistently ran 30 or more miles per week and the other less than 10 miles per week. And we have been able to draw important conclusions about the changes that come with increased running training. We measured the firing patterns of thigh muscle groups and the knee joint motion of the runners using a combination of electromyography (EMG), 3-D motion capture cameras, and a platform that measured the force during foot contact with the ground. The volunteers ran trials at four different speeds between five and 12mph. Our study detailed how those who regularly ran 30 miles or more a week showed neuromuscular changes that improved their running efficiency, meaning they needed to do less work to cover the same distance. This is due to changes in the muscles and tendons triggered by high-mileage training – and these adaptations are enhanced the faster you go. The leg muscles of the high-mileage runners did not have to work as hard as the same muscle groups of runners we studied who were less trained. 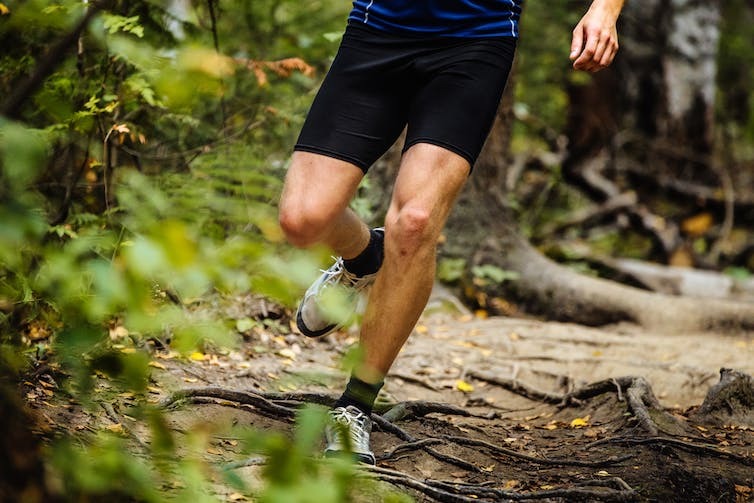 The better trained runners also demonstrated more spring-like behaviour in their lower leg tendons, which helped propel the body forward more efficiently. In short, adaptations that come with running training permit muscles to not work as hard due to a more efficient use of the tendons – and these advantages become even bigger at faster running speeds. It appears that training can enhance the elasticity of the leg muscles and tendons and this can be important for running performance and being able to complete a marathon. These findings agree with direct measurements of the behaviour of individual muscles and tendons in running animals but, up until now, very little research focused on training effects in running humans. This clearly shows that preparing for running events doesn’t just improve fitness –- it changes the very way you run. In fact, the more running training you do, the more efficient you are likely to become. So, the next time you get out the door and run down the street, remember that it will eventually get easier and that your muscles and tendons can become more spring-like and help propel you towards your marathon goal.